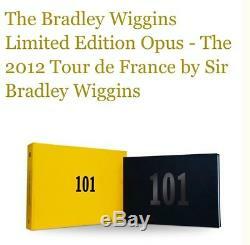 The Bradley Wiggins Limited Edition Opus - The 2012 Tour de France by Sir Bradley Wiggins. Hand Signed by Sir Bradley Wiggins to a luxurious, heavyweight Italian paper insert. The Limited Edition is limited to 300 copies worldwide. 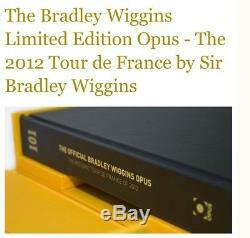 Each copy signed by Sir Bradley Wiggins on a luxurious, heavyweight Italian paper. The sheet has been specially printed and embraces a logo that was worked on and developed with Sir Bradley to reflect his love for style, music and his historic yellow jersey win of 2012. Sir Bradley Wiggins narrates the story as it unfolds, day by day during Le Tour to the stunning backdrop of photography afforded to Team Skys official photographer, Scott Mitchell. The unprecedented access given to Mitchell allows for the greatest insight to Sir Bradley and Team Sky during the Tour. The blood, sweat, pain and euphoria is captured in a way never before possible and is brought to life in this panoramic Opus format. Content: 360 pages, with approximately 90 per cent of all content never before published. Words: Narration by Sir Bradley Wiggins himself, commentary on each stage with statistics on the complete. Tour Images: Over 600 spectacular images which are nearly all from the Official Sky Team photographer, Scott Mitchell who was granted unprecedented access to Sir Bradley and Team Sky. Presentation: Bound in the finest leather and housed in a clamshell case. Gatefolds: Two Giant Gatefolds measuring 180 cm x 35 cm. Book is still in box unopened. Post is Signed for with tracking. 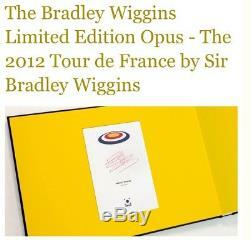 The item "The Bradley Wiggins Limited Edition Opus Signed Book" is in sale since Wednesday, October 18, 2017. This item is in the category "Books, Comics & Magazines\Non-Fiction\Sports". The seller is "weliveinmudhuts" and is located in Wigan. This item can be shipped to United Kingdom.